It's funny how the collective memory begins to fade and shift over time. Here we gather stories and memories from those involved in establishing Education Reach for Texans. Dallas County Community College District in Dallas, Texas graciously hosted the Education Reach convening for the second time. 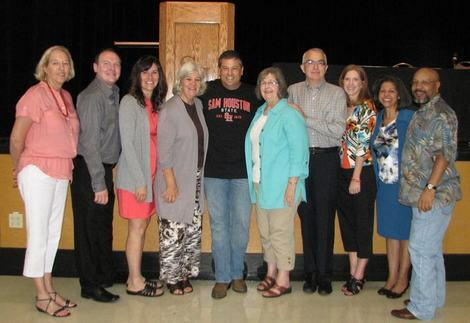 This year marked our Sixth Annual Education Reach Convening. We celebrated six years of organized service to foster care alumni success in higher education, which required decades of work leading up to these events. See the convening summary for details about the event. 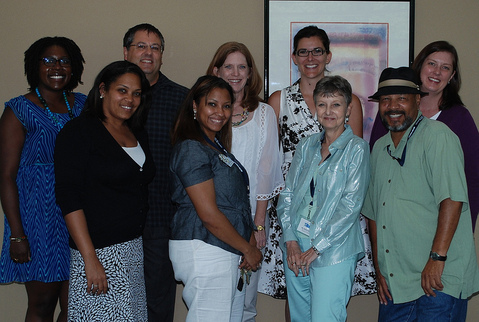 Austin Community College hosts the Fifth Annual Convening in May 2014 with 163 people attending. We condensed the convening for child welfare and postsecondary professionals into a single day to help reduce work outages. At the same time, we hosted our first Youth Gathering bringing together current and former foster youth to discuss and recommend ways to support their higher education goals. Click the image for more photos by Dewy Brooks. The structure of the new corporation continues to evolve. We open our first bank account and apply to the IRS for designation as a 501(c)(3) corporation. We elect Wade Bradfute to our Board of Directors, reelect Clint Rodenfels, and bid farewell to Kathleen Christensen as her term on the board ends. We also unveiled our new logo to match our name and consolidated our two separate websites into a single site. In July 2014, we finally receive notice from the IRS confirming our status as a 501(c)(3) federal tax-exempt corporation. Lone Star College System in Houston, Texas hosts the Fourth Annual Texas Reach Convening in June 2012 with 193 people attending. Click the image for more photos by our own Dewy Brooks. Additional images available from Lone Star College. Shortly after our Fourth Annual Convening we incorporated as Education Reach for Texans, a Texas nonprofit corporation. Sadly, we were unable to retain the Texas Reach name due to similarly named entities already in existence. We constitute our first Board of Directors: Michele Bland, Sheila Bustillos Reynolds, Kathleen Christensen, Keri Rogers, and Clint Rodenfels. Dallas County Community College District in Dallas, Texas hosts the Third Annual Texas Reach Convening in June 2012 with 156 people attending. Click the image for more of Dewy Brooks' photos from the event. 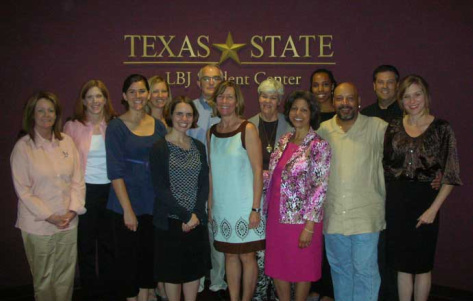 Sam Houston State University in Huntsville, Texas hosts the Second Annual Texas Reach Convening in May 2011 with 127 people attending. Additional photos by Dewy Brooks available here. Texas State University-San Marcos in San Marcos, Texas hosts the first Texas Reach Convening in May 2010 with 160 people attending. We begin as a small group of educators and social workers talking about problems faced by former foster youth in postsecondary education. Some had heard about similar groups of folks in other states getting together to share information and establish programs at colleges and universities. More people join the discussion and we reach critical mass. Hearing of the success of efforts in Ohio, we decide to host a convening where our colleagues and peers can gather and share information. Borrowing from our friends at Ohio Reach, we begin calling ourselves Texas Reach and commence plans for a Texas Reach Convening.